This is part two of a post about using ProtoShare to improve your review process. You can read part 1 here. 2) Keep your feedback simple. ProtoShare’s topics lend themselves to simple, focused feedback. 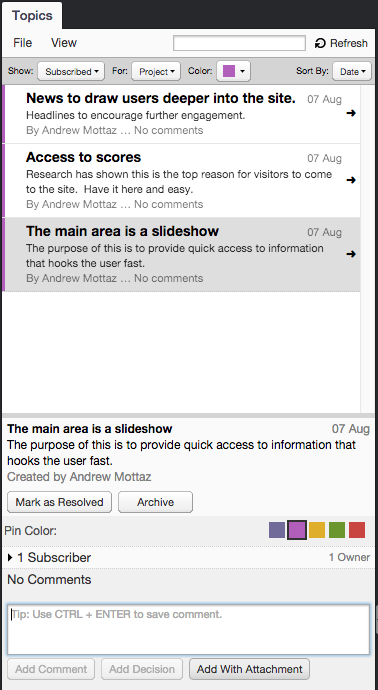 Dropping a pin to create a topic opens a threaded discussion for only the stakeholders you invite to that topic. This allows you to get the right people to see the right information. Create a ProtoShare topic by dropping a pin. 3) Provide guidance with specifics. Because topics are based on the placement of ‘push-pins’, users are encouraged to focus on specific areas of the prototype, and when engaging in a discussion, the context is unambiguous for all stakeholders. Selecting a pin even activates the page states that were active when placing the pin, so you can add pins to pop-up windows, specific slides on a slide show and more, and your reviewers will see the correct context when they select a pin. 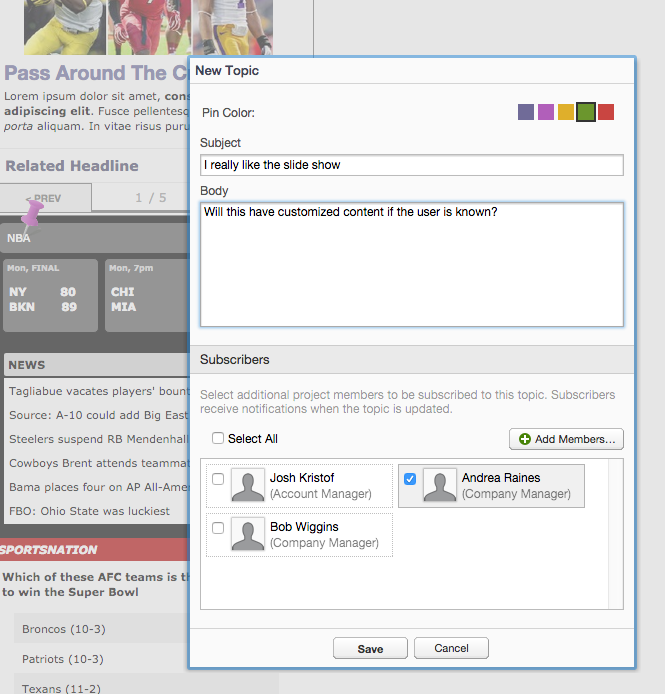 Finally, because sometimes providing guidance requires more information than just a few words, you can add an attachment in a topic response. Whether that is an image illustrating a change or concept, or a pdf with content or copy revisions, ProtoShare’s review lets you keep these items together and in context. Add attachement to ProtoShare Topic. Thanks for reading! Let us know your tips for improving review. Previous post: Review and Feedback – Making the Most out of Your Review Process. Next post: Mobile First is a Hoax?